Radon is the second leading cause of lung cancer in the United States and the number one cause of lung cancer deaths in non-smokers. Individuals who smoke and are also exposed to high radon levels are particularly vulnerable. The United State Environmental Protection Agency (U.S. EPA) has estimated that radon is responsible for more than 21,000 deaths per year in the United States. The only way to know if your home is safe is to test the radon levels. How does Radon Affect Lung Health? What can I do to protect myself from radon? Radon is an odorless, colorless and tasteless gas that is released by the natural decay of uranium, a naturally-occurring rock in soil. When radon is released, it can seep through cracks in the foundation of our homes. Radon decays quickly, giving off tiny radioactive particles. When these tiny particles are inhaled, they can damage the cells in the lungs. Long-term exposure to this deadly gas can lead to lung cancer. Many years can pass between exposure and cancer diagnosis. Not everyone who is exposed to radon will get lung cancer. According to the U.S. EPA, nearly one in fifteen homes has elevated radon levels. The only way to know if your home is safe is radon testing. Test kits can be purchased at most hardware or home improvement stores. They are simple to use and typically cost between $15 and $25. If your home has unsafe levels of radon, there are effective radon reduction systems. Respiratory Health Association is active in advocating for awareness of radon risks, the importance of home testing, and greater disclosure of known radon risks in Illinois. 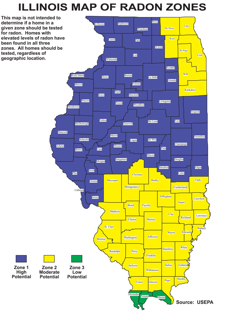 Below is our map of radon in Illinois. Additional resources can be found in the Radon section of our Library. Note: This map is not intended to determine if a home in a given zone should be tested for radon. Homes with elevated radon have been found in all three zones. All homes should be tested regardless of geographic location. It is recommended that homes be tested every two years.